Colour 800i/1000i Presses säljs inte längre som ny. Du kanske ska välja ersättningsprodukten i stället. 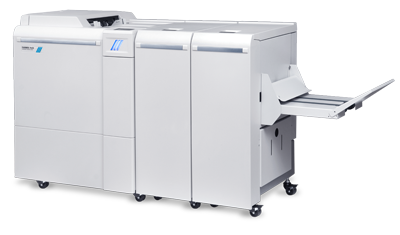 The Xerox Color 800i and 1000i Presses offer print providers a competitive advantage through the ability to enhance printed output with true Pantone metallic gold or silver inks. Other features that come standard include: Full Width Array, Auto Sheet Clearing, HyperRIP from Fiery, and more. 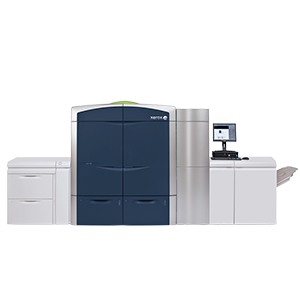 Learn about the technology features inside the Xerox Color 800i/1000i Presses, delivering vibrant image quality, best-in-class availability, and optional clear, silver and gold dry inks. Combine the power of personalization with clear dry ink for the Xerox Color 800i/1000i Presses. Gain a clear advantage with clear dry ink for the Xerox Color 800i/1000i Presses. Bestruket och obestruket papper, kritvitt papper, DocuCard, etiketter, visitkort, eleganta broschyrer, fönsterdekaler, slitstarkt/syntetiskt papper, gratulationskort, flikar, relief, polyestermaterial och andra specialmaterial. Med alla de alternativ för matning och efterbehandling som finns för din produktionsutrustning från Xerox kan du lägga till de funktioner som bäst passar din jobbmix och förbättrar ditt arbetsflöde. På så sätt kan du hantera fler jobb samtidigt och öka avkastningen på din investering. EDP Association The Xerox® Color 800i/1000i Presses were recognized at the 2016 European Digital Press (EDP) Awards at drupa in Düsseldorf, Germany. The Xerox® Color 800i/1000i Presses were named Best cut sheet color A3+ printer 100.000 - 400.000 A4/month. EDP honors the best developments in print production tools, software developments, substrates, inks, materials and finishing systems. MyPRINTResource Metallic Gold and Silver Specialty Dry Inks for the Xerox Color 800/1000 Presses have won the distinguished 2015 Quick Printing Top Product Award for Ink & Toner. The winners were elected by print service providers worldwide based on what they consider to be the most significant products introduced to the commercial printing industry over the last 15 months. 2016 InterTech Technology Award The Xerox Color 800i/1000i Press with Metallic Dry Inks has been recognized by the Printing Industries of America (PIA) with a 2016 InterTech Technology Award. The winning technologies were selected by judges as being truly innovative and expected to advance the performance of the graphic communications industry.